Below is a pictorial review of our kitten’s first 10 to 12 weeks here at RegencyRags including the finer points of our commitment to the health, temperment and beauty of our Ragdoll kittens. I stay with the mother and babies until the last one is delivered. This can sometimes take over six hours and it exhausts me as well as the mother. Only one time I’ve needed an emergency C-section when it turned out Daphne had a tubal pregnancy. 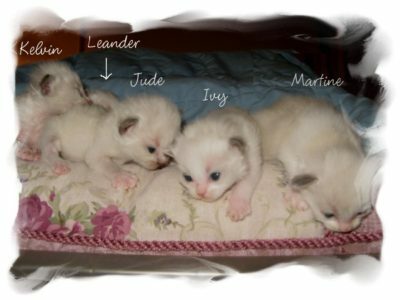 Luckily most births are uneventful and the kittens are born without complications. 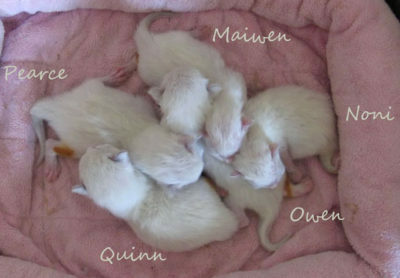 Normally I send around a picture of the newborns to those on the waiting list within the first week of the kittens birth. Then I typically start sending out pictures once a week when the kittens reach 3 weeks old and it’s easier for me to take pictures of them. To take pictures of very young kittens means I have to disturb them, and I try to leave them cuddled with their mother as much as possible. Also, at 3 weeks old the kittens start to actually look like baby kittens — up until then I think they more resemble baby mice or hamsters! Plus until they turn 3 weeks old they wiggle around so much it’s hard to take a picture without flash that’s not fuzzy. 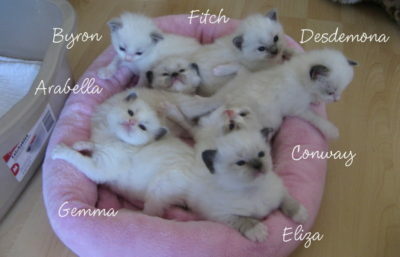 So, I’ve inserted to the left a picture of a litter of blue bicolor kittens — and one blue mitted! — at 2 1/2 weeks old. I remember I took something like twenty pictures to get this one and still they weren’t looking in my direction. By 2 1/2 weeks old the kittens have had their eyes open about a week. I love looking through all my previous kitten photos. Each kitten is so precious to me. And if pressed I can actually name every single kitten ever born to RegencyRags. It may take me a few minutes and I have to write out the alphabet to do so, but I can do it! Then comes the start of litterbox training at 5 weeks old. That’s always a joy. The kittens are starting to be sure on their feet, but they’re still babies and toddling around is really all they can do at this point. Yet, they’ve now decided the meat isn’t really all that bad, so it’s time to learn how to potty in the litterbox. This can be a challenge for some kittens. Others take to it right off. I start them with pine pellets (i.e. Feline Pine) and a low profile litterbox. My favorites for tiny kittens are long and wide because when one kitten pops in the box to potty the rest follow. It’s a mass potty experience. Some of the kittens just join in for the fun and start tossing litter around with their paws. I’d say at 5 weeks old the kittens are making it to the litterbox almost 50% of the time. At first they like to find their own spot. Sometimes I move the litterbox to where the group has decided to potty and this makes it easier on me. Suffice it to say that a lot of clean up is involved at this point. In going back through pictures to put on this page I find it interesting that if I skip a week taking pictures it’s normally Week 5. I know it’s because I spend most my time cleaning up after the babies. At this point the kittens start inspecting their mother’s Royal Canin Persian dry food and begin nibbling on that as well as the raw meat. It’s fine for the mother and kittens to supplement with the Royal Canin Persian dry food as long as they are also eating the raw meat because the Nature’s Variety Instinct frozen raw meat is best for the digestive tract of the Ragdoll. At 5 weeks old I start introducing different flavors of the Nature’s Variety. The top favorites of the adults and kittens alike are Duck and Rabbit — the most costly of the choices, of course. (Pictured to the right is Oz at 5 wks old, a gorgeous blue lynx bicolor male out of Daphne x Aristede). The health and subsequent well-being of our Ragdoll cats and kittens is of the utmost importance to us, equal to temperament and beauty. As a hobby breeder, I am able to keep the number of cats I keep in my cattery small. This in turn decreases the risk of disease — most importantly the dreaded FIP virus. Unlike dogs that live in packs, cats are typically solitary creatures who live alone or in small groups of two or three. They are companionable and in the wild (as feral cats) they do form small colonies, but never in large numbers seen in dog packs. Because of this cats do not have a naturally strong immune system. Their immune systems are easily stressed when kept around a large number of other cats. This stress leads to a higher susceptibility to disease. Most cats come in contact with what’s known as the Corona Virus. It’s like the cold virus in humans — we all come in contact with it at some point. And like the human cold virus, the corona virus is typically harmless in a healthy cat of kitten with a well-developed immune system. However, in some cats — and we don’t know the exact causes, although it’s hypothosized that stress is the leading factor — that corona virus mutates into FIP. Catteries with a higher cat count are naturally more prone to FIP due to the stress cats endure by being kept with a high number of other cats. (For more information on FIP and its causes, please visit http://www.sockfip.org/). Some reports indicate that households with more than four cats begin to become more suseptible to the corona virus mutation. The higher that number increases the higher the stresses. This means that most catteries having more than four cats are at risk for FIP. That puts a big responsibility on breeders to keep their cats as healthy as possible. One of those ways is to keep the litter boxes scooped twice a day and the boxes sterilized with a bleach solution once a week to kill the corona virus. The second step is to keep the cats in smaller “colonies” in the house — in groups of no more than four cats. Here are RegencyRags I have my nine cats separated into three groups that each have their own litterboxes, sleeping quarters, water and food dishes. Everyday these groups get to spend time with the family. They are never cooped up and kept from the love and attention all Ragdoll cats need. Yet, keeping them in distinct living quarters ensures that diseases are kept to a minimum. Likewise, when I’m showing a cat — like I did with Bruno during the show season 2010-2011 — I kept him with one other female in my own bathroom so that when he came home from shows he wasn’t spreading anything he might have picked up in the hotel room or showhall to the rest of the cats — most importantly away from the baby kittens that have little to no immunity during the first 8 weeks of their lives. Your RegencyRags kitten receives his first vaccine at 8 weeks old and at this time he’s allowed to receive his first visitors. 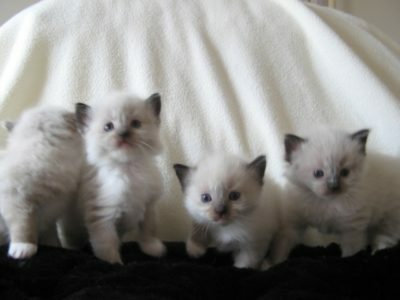 The health of the Ragdoll kittens produced by me depends heavily on the health of the parents. I take excellent care of my cats. They want for nothing. I primarily feed Royal Canin dry and various grain-free canned food along with Nature’s Variety Instinct Raw food. For a long time I thought breeders who fed frozen raw were over doing it a bit — until I tried it myself and saw the difference in the cats. Not only are they healthier and happier, they have better weight, silkier coats, and smaller, denser stools with less order. I love the side benefit of less odor the best! 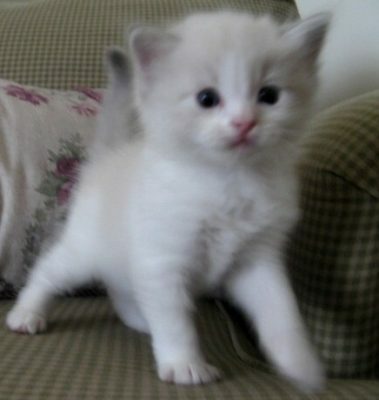 The last but not least level of excellence I strive for in my Ragdoll cats and kittens is beauty. I actively show for confirmation in TICA. This is the same organization in which my kittens are registered. I aim for a sweet doll face, a medium length rabbit soft coat, sparkling blue eyes, long fluffy tails, medium long length to the body with good musculature and good size, along with the finer points of show conformation including but not limited to excellent modified wedge head type, pronounced change of direction from nose to forehead without creating a break, strong chins, correct eye shape and placement, medium size ears with proper placement, and a wide muzzle. 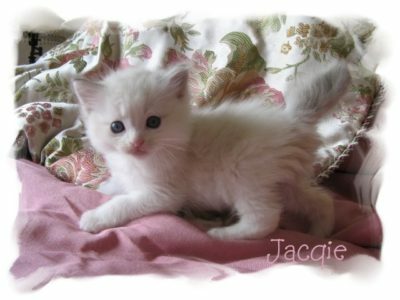 Feel free to browse my galleries for many pictures of my Ragdoll cats and kittens I’ve taken over the years. Click the Galleries tab to the left. The pictures speak of the beauty I strive for in my cats. 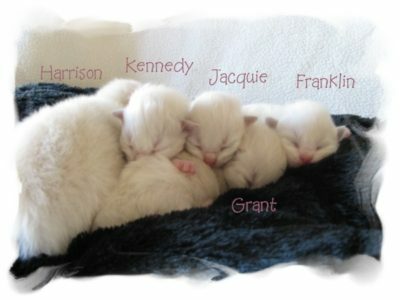 I also have many pictures posted on my Previous Kittens page that have been sent in by kitten buyers. I love to get pictures of my babies because it helps me to what the tiny kittens look like as they mature. Sometimes the pets don’t have the perfect markings of a show Ragdoll cat or kitten, but the beauty is still there. I like to think that these three key elements of health, temperament, and beauty make a RegencyRags Ragdoll stand out from the rest. They shout out: Notice me! to even the casual passerby because they are all that.